Alan brings Mister Salsa's Dance Class to Bar Venezia! open for Salsa at 7:00pm, Lesson Starts 8pm, dancing till 10pm. Absolute Beginners AND Intermediate Classes at 8:00pm TILL 9:00 FUN dancing till 11pm. Great Venue, free parking, full bar. Fun and Friendly atmosphere! £5 on door. Absolute Beginners AND Intermediate Classes at 4:30pm TILL 6:00 FUN dancing Great Venue, free parking, full bar. Fun and Friendly atmosphere! £5 on door. Classes,and tea dance for all levels. (S. Glam) Salsa Cha Cha provides professional and quality Latin American dance classes in Cardiff, Barry and Penarth. Our classes are great fun and contain pupils of all ages, everyone is welcome. We specialise in Beginners classes and we are very patient! Bristol Salsacise - a form of exercise using latin music and moves. Spend 45 mins building up a routine and then perform it at the end! All ages, all abilities no partner required. Salsa lessons & Latin dance club. The Hatchet Inn, Frogmore St, Bristol. Classes from 7:30pm to 9:30pm, party from 9:30pm to 10:30pm. Prices: 1 = £5, 2 = £8, party = £2. A Fun Class aimed at anyone interested in learning to dance. We teach mainly Salsa but always include a Latin/Ballroom dance lesson at the end of each class. New Beginners welcome. Large FREE car park, wooden dance floor, great music, cheap bar. (Gloucs) 7.30pm Beginners Course, 9.00pm Improvers. Dancing 'til 11.30pm. Cardiff New Beginners Classes in Salsa/Latin American Dances start week beginning Monday September 7th in Cardiff, Penarth and Barry. Check out the details on our Web site - www.salsachacha.com. Cardiff Salsa Night 7:30pm Beginners, 8:10pm Improvers, 8:40pm Intermediate,9;30pm Freestyle. With DJ Mister T. £5 before 9:30,else £3!!! Cardiff Learn Salsa, Merengue & Reggaeton with the famous Colombian Dancer Yonier Garcia from 7.15-8.15pm on Monday night. The class is suitable for adults of all ages and abilities and can be used for keep fit, dance techniques, or just for fun. Cheltenham Absolute Beginners to Advanced Salsa Classes with SALSA SQUAD. Just turn up with or without a partner. Fun & friendly atmosphere, 80-100 attending every week. £5 on door. those with two left feet are absolutely welcome! Absolute Beginners 8 week course £45. Improvers & Intermediate £6.00 per night. (Devon) Latin DX class.A fast-paced dance exercise class with top Salsa instructor Angus Peters guaranteed to put a smile on your face! 10am-12noon. £5 inc. coffee/tea after! ZUMBA is a Latin-inspired dance-fitness class with infectious music and easy to follow dance moves that will tone and strengthen the body. Each energizing workout burns 400-1000 cal. Please see website for latest info on levels + venue. (Gwent) Salsa classes beg. 8.00. Seaton, Devon Salsa X-Body/La Rueda, Bachata etc. Class - Mondays from 7.30pm. Beginner, Imp & Int levels (£5). Friendly, relaxed evening with bar. No partner reqd. Parking nearby. (Dorset) NEW CLUB,starting from 1ST June. SALSA AND ARGENTINE TANGO. £7 per class £10 for both classes. (Somset) KEITH & LU FUN SALSA AT NEW VENUE.STARTS 5TH DECEMBER. 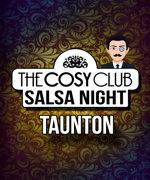 (Gloucs) Salsa classes with Hayon and the SalsaFlex team. New beginners welcome every week. (Somset) Salsa Rebels Presents its long running company by bringing back by popular demand Latin lessons to Wells. Lessons by Best Newcomer nominee Damo T Welch recently back from his European tour. (Somset) Universo Latino UK Brings you Latino Mania Every Monday @ The Sherston, Wells. Lessons by International teachers Damo, Rebecca & Amanda. Workshops for Beginners to ADV. Weston-Super-Mare Salsa dancing in Weston at The Borough Arms, we also include Bachata, Cha-Cha & Rueda. Every Monday including bank holidays, 2 classes a night and free dancing from 8pm to 10pm only £3. Zumba� Kids Jr. is designed exclusively for kids 4 to 7 years. Drop in: £5. Zumba� Kids is designed for kids 8 to 13 years. Drop in: £5. The Dancier, low-impact version of Zumba� without compromising on the Fun! The Zumba Gold� formula has the moves and pacing to suit the needs of participants on a journey to a fit and healthy lifestyle. (Gwent) Salas with Ron. All level beg. - inter. 7-10pm. Absolute Beginners Course & Improvers Class, Evening Starts At 7:45pm. 8 Week Absolute Beginners Course £40, Improvers & above £5.50 entry. Cardiff Cuban Salsa Classes with Salsa A Lo Cubano! Cardiff Salsa Classes and dancing in Cardiff. Fun & friendly in the heart of Cardiff. Cardiff Tuesday night is our dedicated Beginners and Improvers night. first Salsa experience this night is dedicated to you. The funkiest Salsa night in town! The Friary, Cardiff CF10 2AQ, near the Hilton Hotel. Cardiff Learn Salsa, Merengue & Reggaeton with the famous Colombian Dancer Yonier Garcia from 5.30-6.30pm on Tuesday night. The class is suitable for adults of all ages and abilities and can be used for keep fit, dance techniques, or just for fun. Fun & Friendly and no need to bring a partner. Cheltenham New - Salsa every Tuesday opens...at our new top class venue in Cheltenham. @ Apr�s Bar - The Brewery Cheltenham. Cheltenham Salsa Classes every Tuesday and Party Night At Apres Bar- The Brewery in Cheltenham. Tuesday 27 January @ Apr�s Bar-The Brewery in Cheltenham. Exeter Salsa and kizumba classes starting at 7:30 and costing £5 per person which includes one on one tuition with Abes Cisse. Free parking and fully licensed bar. Cowick Street, St. Thomas, Exeter. Just off the big roundabout, opposite the Halifax. Free car parking in the public car park next door. Exeter Salsa classes 8:10 beginners, 9:15 intermediates. Freestyle practice after the class. Beginners: £5.50/£4.50 Intermediate: £6.00/£5.00; £7.50 both classes. 7 The Parade, Exmouth - on 3-way traffic lights in town centre. Classes start 7:30, Improvers 8:30, party until 11. £5 for all classes and party, £3 for party only. Absolute Beginners to Intermediate Classes at 8pm then dancing to 11pm. Great Venue, free parking, full bar. Fun and Friendly atmosphere, 100+ attending every week. £5 on door. Please see website for latest info on levels and venue. (Cnwall) 8:00 beginners, 9:00 intermediate. smugglers Inn, 3Calais Rd,St Erth Praze. Langport Regular courses/weekly classes stopped running, look out for special workshops. (Gloucs) salsa class. beginners and inprovers.classes till 9.30 dancing till 11.
with celebrity Latin instructors Anna and Thomas. (Venezuela) Salsa Del Sol team. (Somset) SALSA BRAVA UK! Great lessons with Somerset's leading teachers-Martin, Karine, Laura, Richard, Seiko & Hannah. No partner needed. (Avon) Find out what's happening with Latin Fever - enjoy the real Latin experience. Salsa, Bachata, Merengue and Party Dances. (Dorset) Salsa dance classes with Salsa Amor. learn to Dance or Improver your dancing Skills. Absolute Beginners Courses & Improvers classes, evening starts at 7.30pm. 8 week Absolute Beginner Course £40, Improver & above £5.50 entry. & THE SALSA EXPLOSION TEAM. Cardiff Salsa in the heart of and overlooking Cardiff Bay! Upstairs at Terra Nova. Dancing from 9.45pm till late. 19:30 Til late Learn to salsa the Cuban way! Non-dancers and two left feet welcome, You don't need a partner. £3 for freestyle per person. (Somset) classes for all levels. £7 PER CLASS OR £10 FOR BOTH CLASSES. (Gloucs) Salsa classes with Hayon,Joe and the SalsaFlex team. Monmouth Cuban Salsa classes for beginners and improvers. (S. Glam) Learn Salsa & Pop Choreography with the famous Colombian Dancer Yonier Garcia from 7.15-8.15pm on Wendesday night. The class is suitable for adults of all ages and abilities and can be used for keep fit, dance techniques, or just for fun. 1st Floor of the Marina Bar, Vauxhall Quay (on the Barbican nr Vauxhall Street). Classes start at 8 p.m.
Absolute Beginners Courses start regularly throughout the year, see website or contact Duncan to book a place. Tiverton Beginners/improvers. Dancing to a fusion mix of Latin, Afrobeat, and Funk. 7-9pm. £5 for one hour, £7 for two. Check the Oak Room Facebook page for updates (link below). (Devon) Dan & Bex bring you a fun weekly Salsa class! (Dorset) Salsa Dance classes every Wednesday with Salsa Amor. Price includes freestyle 9.15 till 11. Beginners 6 week Course £24 & Improvers £4.50 for the whole evening! Large wooden dance floor and free parking. Weston super mare Unfortunately Carnaby's closed, changing ownership. (Somset) Absolute Beginners to Advanced Salsa Classes with LATIN FEVER NIGHTS . Classes at 8.00pm then dancing till late. No partner necessary just come along and enjoy yourself. Absolute Beginners Course & Improvers Class. 8 Week Absolute Beginners Course ?45 per person. Improvers & above ?6 entry. (Devon) Mister Salsa's Dance Class. Salsa for all. Beginners, Improvers and Intermediates! Classes start at 8:00 for Beginners. Free dance from 10:00. Dancing til closing time. (Dorset) Thursday evening Salsa classes. 8-9pm and 9-10pm. These run as courses... please phone or see website to find out about the next course start dates. (Dorset) Daytime Salsa classes 12noon-1pm and 1-2pm. These run as courses, please phone or see website for details of the next course start dates. please arrive 5min before the class for the intro. BRISTOL CUBAN SALSA( RUEDA DE CASINO,SALSA) AND KIZOMBA ,SEMBA CLASS BEGINNERS. Learn salsa straight from Latin America with Willian & Lauren Velasquez. The most fun you'll have burning calories! Bristol The South West's only weekly Kizomba night. KIZOMBA - the sensual Angolan partner dance taking off across the UK. It is easy to learn but - be warned- very addictive! 2 levels of class with Ian & regular guest teachers. Classes & 2hrs of freestyle. ......Salsa scene live bands, Performances and more.. Fantastic dance floor, friendly crowd & cheapest bar in Bristol! ALL WELCOME. Cardiff Cuban Salsa Night with Salsa A Lo Cubano! The place to dance REAL CUBAN style! (S. Glam) Thursday nights is back with a fantastic new venue. Beautiful wooden floor, aircon and fans galore. Brand new venue that looks like it's been purpose built for Salsa. So come and check out the best new Salsa night in town! Large dance floor & free parking. (Gwent) Salsa lessons every thursday. Beginners 8pm-9pm, intermediate 9pm til 10pm. £4 a lesson/£3 concessions. Free entry to the club, DJ's til 2am. Plymouth Salsa Classes. 7:00 Induction. 7:30 Beginner. 8:30 Improver. 9:30 Bachata. Classes 7-10pm followed by dancing till late. No need to bring a partner & pay as you go. Fantastic wooden sprung dance floor. We teach Tango in small group lessons in a 6 week course suitable for Absolute Beginners. The 1st Dance Studio teaches Salsa in small group lessons of a maximum of 12 students in a 6 week course suitable for Absolute Beginners. Lessons by qualified UKA,UKE and IDU teachers. Specialists in La Salsa and Kizomba we plan to bring true salsa to street. Torquay Bachata Night at Club Rainbow in Torquay. (Cnwall) Weekly Salsa lessons and social dance, beginners to Improvers, all welcome. 8.30 - 11.30pm. Entry £5 with lesson. Bristol Salsa classes: 6pm Beginners, 7pm Improvers. £5 per class or £7 for both. NUS: £3 per class or £5 for both with one-off fee of £2. Access via blue gate on Bridewell Street. Up the stairs, down the hall! Dj Mike playing all the best latin tunes around. (S. Glam) Ladies salsa styling classes for 3 weeks on Friday June 20th, 27th & 4th July. Routines set to Ladies timing including footwork & body rolls. The Place (formerly Moda/Time), Hight St, Cheltenham. (upstairs level - separate entrance) 17 Station Hill Smart, spacious venue with air conditioning and nearby car parking. (Avon) LAUNCH 7th Sept 2007. Salsa FRIDAY!. Classes at 8pm and 8:45pm followed by DJ Marco 'till late. (Devon) Zumba Fitness Class - incorporating: Salsa, Merengue, Bachata, Cha Cha, Reggaeton, Bollywood and More !!! Booking necessary to secure places. The 2nd & 4th of every month brings you the best in SALSA , MERENGUE, BACHATA, REGGAETON & the best Latin tunes! (Dorset) Lesons and dancing from 7pm-10pm. Lessons run as courses, so book in advance. Next Absolute Beginners Course starts Friday 7th November 2008. @ St.Pauls Hall (see website for occasional changes! (Somset) SALSA BRAVA UK! Great lessons with Somerset's leading teachers, Martin & Hannah. Friendly atmosphere at a beautiful dance studio. Beginners with Hannah, Improvers with Martin. THE BEST LATIN NIGHTS OUT IN THE AREA..
Absolute Beginners Bachata classes 7:30pm & 8:30pm only £4 per Class. Dancing till 11.00pm with refreshments supplied. Winchester Zumba� Dance Fitness with Silvia and Max at the River Park Leisure Centre in Winchester. (Devon) Original 50s Rock 'N' Roll Club. Cuban Salsa-Rueda from 10pm until 11pm then after-party until 2:30pm. Huge variety of music from all styles e.g Salsa,Merengue, Reggaeton, , Bachata, Chachacha etc. This is an exciting, hot and full of fun and energy. REGGAETON course with ALAIN HERNANDEZ. Cardiff The only weekend Salsa venue in Wales! Cardiff The only Saturday Salsa venue in Wales! We bring the spirit of Latin America alive every Saturday night - 11pm till 2am. (Somset) Salsa & Son.. PR/Cuban style for beginners ,and those who wish to add another style. NB .... Both B.Room and salsa classes will not commence until Sept..... AND.. salsa class will revert to 1pm.on the first set Sept. date announced .